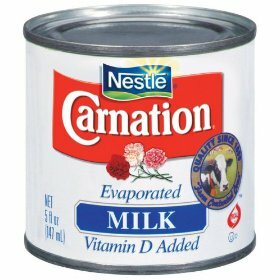 How are evaporated and sweetened condensed milk different? What types of recipes require evaporated milk? Today’s Wonder of the Day was inspired by Brooks. Brooks Wonders, “Do you need milk to be strong?” Thanks for WONDERing with us, Brooks! Drink your milk! That's a command that most children hear often as they're growing up. Why? Milk contains calcium and other nutrients your body needs to grow healthy and build strong bones. Do you drink milk each day for lunch? Many school cafeterias serve several types of milk, including chocolate milk and maybe even strawberry milk. Many kids also have milk for breakfast if they eat cereal. Today's Wonder of the Day is about a special type of milk called evaporated milk. Have you ever had evaporated milk? Chances are you probably have. Even though few people drink evaporated milk, it's used often in many different types of recipes. The future scientists among you may be WONDERing how there can even be such a thing as evaporated milk. After all, evaporation is the process of a liquid turning into a gas. Is evaporated milk just a gas? Not at all! Evaporated milk — sometimes called dehydrated milk — is just regular fresh milk that has about 60% of the water removed from it. After the water is removed, the liquid that remains is cooled, sterilized at high heat (around 240° F), and then canned. Vitamin D is also usually added to boost the nutritional value of evaporated milk. The heating process gives evaporated milk a darker color and a slightly sweeter, caramel-like taste. Evaporated milk also has a higher concentration of nutrients and energy. This means that one cup of evaporated milk will have more nutrients and provide more energy than one cup of fresh milk. Evaporated milk is sold in cans and does not need to be refrigerated because of the sterilization and canning process. This made evaporated milk very popular long ago before refrigeration became widely available. Evaporated milk was also popular because it could be shipped long distances to areas that could not safely produce or store milk. Evaporated milk has a shelf life of over a year, if it does not contain added fat and sugar. Evaporated milk usually comes in whole, low-fat, and fat-free varieties. Today, evaporated milk is used most often as an ingredient in various recipes. It is particularly useful for baking desserts, since it adds rich flavor. Some people also use evaporated milk as a substitute for cream in coffee drinks. If you look for evaporated milk in your local grocery store, you'll usually find a similar product nearby: sweetened condensed milk. Are these two forms of milk the same? Can they be used interchangeably in recipes? Evaporated milk and sweetened condensed milk are similar, yet different. Sweetened condensed milk starts out as regular whole milk. It is mixed with about 40-45% sugar and then heated until about 60% of the water evaporates. The end result is an extra-sweet liquid that's a popular ingredient in dessert recipes. Cooks know that you can't use evaporated milk and sweetened condensed milk interchangeably in recipes. Because of the difference in sugar content between the two, mixing them up in a recipe will result in a dish that's either too bland or way too sweet. Tomorrow’s Wonder of the Day is a piece of cake that you’ll really get a kick out of! Ask a friend or family member to take you on a field trip to your local grocery store. Check the baking aisle for evaporated milk and other types of canned milk. Also check the dairy aisle to see what other types of milk they have available. Compare the nutritional facts of the different kinds of milk you find. Which one has the most sugar? For a fun science experiment that involved milk, check out Steve Spangler Science's Color Changing Milk experiment. You'll need some milk, food coloring, and a bit of dish soap. Have fun! That's right, charles! We also have a Wonder to help explain this: Wonder 1800: How Far Can a Sneeze Travel? We hope this Wonder helped you learn more about evaporated milk, jt!! Great question, Harsh! Have you seen Wonder 1385: Why Do We Have Homework? Hey this is a wonder that I submitted but no one answered it. I was wondering why do they call hush puppies hush puppies? It dosen't make sense to me. Could you answer please? Now it's really close yyyyyyyyaaaaaaaaaaaayyyyyyyyyyyy. My birthday is April 30. Yay. OK, so it's almost my birthday, I'm so exited. I just wish I could meet you in person you seem nice REALLY REALLY nice. Well see what you put up tomorrow can it please be about bacon. Awwwww that's so sweet. Now you're my BFF. I check this every day. I love wonderopolis! Can you tell me one of them? Sorry I was mean to you, I just wondered why would you put a cooking video on here. Weird video. It's just a cooking video oh and can you tell me your name??? I wondered that if you could drink evaporated milk. I thought that is bad for us. Can you do a new wonder on Friday? Keep making great super duper wonderopolis for everyone. This seems really cool!! I honestly don't really know how they would do this, but I know my mom is a great cook and my whole family would love this!!!! Thanks. Dear Wonderopolis, I had no idea to what evaporated milk was or that it exists until now! Thanks. Do you know what evaporated means? I forgot what it means, when I remember, I will tell you, then I will post for will I wonder about the next WONDER. I loved today's wonder of the day, and it helped my mom learn how to use evaporated milk when cooking. I have tried it before in ice cream, and it may taste good in certain foods...like you said. Sometimes I sneak it from her cupboard... it tastes awesome!!!! My mom found a recipe with evaporated milk and I will try it out this weekend. I think tommorow's wonder of the day will be about kitchens. I love to bake with my grandma. She used to be a professional baker. Did you ever make a wonder that was about graffiti? It is neat to make pralines and they look delicious. So to make milk powder basically we need to get rid of the water completely. Hi. I loved today's wonder of the day. I love pralines they are awesome. They make the BEST super bowl snacks!!! Thanks for sharing all of that info about pralines. Oh by the way, my daughter is in Mrs. Messmer's class. Have a good day!!!! I've been wondering how fabric is made and thread. I also like sewing, knitting and crocheting. I like coming to your website! Thank you for showing us how to make pralines. We'll probably go home and make some pralines. Pralines are used as desserts. They are sweet to taste. You can use evaporated milk on desserts. It is yummy. I love how the woman put all of the recipe in the pot. Also, it was good when the cookies were done. I have one more question, why didn't she eat it? When she finished the recipe, it made me hungry. Also, what is brown sugar? I like how the video showed us how the pralines could be made. We found out that Eagle Brand milk is different from evaporated milk. This is what you said: first white sugar then brown sugar last evaporated milk This will make pralines and they look WONDERful! Hey wonderopolis, this was a good wonder. I learned something new. I want to know how long you cook the mixture for the pralines. I liked that the recipe was given for us to make the pralines. I didn't know you could make evaporated milk by heating up milk. I think I will like the pralines she made in the video. I could try to make some with my mom. Very cool! I always wondered what evaporated milk was! Thanks! How do the people who make evaporated milk know how much water is evaporated? Evaporated milk looks like spoiled milk, but it's good for cooking, deserts and coffee. Evaporated milk looks yellow. Thanks, wonderopolis, for the great wonder of the day. Why is it different? I thought it just was milk, until I read this. How do you guys make these? These are so interesting. I love to bake with my mom. When I grow up, I want to be a baker. So, when we use Evaporated Milk, I love to take a little bit on my finger and lick it off because it is so delicious. I wonder why it tastes so yummy to me. Although, I still like it. Hi wonderopolis, I think tomorrow is going to be about kitchens. Today's story was really good and it provided some good tips about how to use evaporated milk when cooking. We think evaporated milk would taste good in desserts and certain drinks like you said! We'll have to go home and try some of the recipes with our families. Evaporated milk is sometimes used as a substitute for what in coffee drinks? Evaporated milk is regular milk that has had about what percentage of its water removed? Evaporated milk is sometimes called what? bsweetened condensed milk Not Quite!